Jeffrey Bradbury, author of Kidblog: An Introduction to Blogging With Your Students, is the creator of TeacherCast.net, TeacherCast University, and Educational Podcasting Today. He is an ASCD Emerging Leader, Google Certified Teacher, Google Education Trainer, PBS Learning Media Digital Innovator, Microsoft Innovative Educator, Microsoft Surface Expert, Microsoft Trainer, speaker, writer, podcaster, broadcaster, consultant, and educational media specialist. He is currently the Coordinator for Technology Integration for the Westwood Regional School District in New Jersey. In 2012, Jeff was recognized as one of top 50 educators using social media at the first ever Bammy Awards and has been nominated three times in the category of Innovator of the Year. Jeff has Keynoted for the Pearson Authentic Learning Conference, EdTechNJ, and most recently at Columbia University’s Teacher College and Podcast Mid-Atlantic. Jeff earned his Bachelor’s and Master’s Degree from West Chester University in Pennsylvania. In his free time, Jeff enjoys teaching, web design, broadcasting, playing viola and violin, conducting, and spending time with his wife Jennifer and their three year old triplets. Ever since I can remember, I was into technology. I can remember getting my first hand-me-down computer from my dad in my early teen years and over time, I took that machine and frankensteined it into a monster gaming machine. Together, my dad and I would start our own mildly-successful web design business which would eventually lead into me creating websites during high school and college for all of my clubs and organizations. My first jobs were at computer and office supply stores that enabled me to work closely with vendors and product representatives. This gave me my first inside look at not only the products I was selling, but what the industry was like globally. As I entered the classroom, I always tried to push the uses of technology with my students. 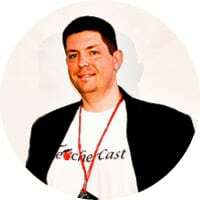 This eventually lead me to create TeacherCast.net in 2011 and the rest has been an amazing journey that has led me to work with students, educators, and edtech companies worldwide. Podcasting: I love the idea of Podcasting/Broadcasting as a STEM activity and that the production studio is just another version of a Makerspace. Teacher Creativity: Every day, while working with teachers, I try to unlock their potential by showing them how to take a lesson that perhaps they have taught several times and turn it ever so slightly to bring a different dimension into their classroom to give their students a more enhanced learning experience. The other day I was sitting with my three-year-old triplets and we were playing on my iPad. I turned on an app that teaches spelling to young learners. In a matter of seconds, I had 30 fingers attacking my ipad trying to spell simple words such as Dog, Cat, and Elephant. The babies started to problem solve and after a while they figured out how to move the lettered tiles on top of the given words to move on to the next word. It was amazing to sit back and see these tiny humans who can’t read yet, spell and communicate with each other in a very basic level to complete a task. My babies have always been my biggest edtech influencers. Beethoven: I have always loved listening to the music of the great classical composers. I have my masters degree in orchestral conducting and I have conducted 8 out of his 9 symphonies. Each piece, each movement, each melody is very unique and “Beethovenesk” yet it is in many ways a total evolution of his previous compositions. It shows a constant moving forward of his style and it is this that makes him memorable 200+ years later. My wife: We just celebrated our 10th wedding anniversary. Over the last 5 years, we have supported each other through the birth of our premature triplets, having to bring only 2 babies home while visiting 1 baby in a youth medical facility for 3 years, a total transition from a two income home to a single income home and a move 3 hours away from our families, and now we are in the middle of treatments for Breast Cancer. This is only the tip of the emotional iceberg we have been on. She has supported me throughout the last 6 years of creating TeacherCast and supporting not only our family, but a community of teachers and students who visit the website and download the podcast every day. Over the last 6 years of working closely with edtech companies and school district leaders, I have seen many trends come and go. Where there certainly are the major companies in the world who are innovative by nature and pushing the envelope, the companies that stand out the most are the ones who are pushing the edge from inside the classroom. Every now and again, I see a teacher who, while still working hard in the classroom, comes up with an idea for an app, or a product, and puts it together to better his/her students. I have seen some great apps come out of the hands and minds of teachers and even though the apps have taken off, those individuals are still dedicated classroom teachers. There is something to be said for someone who loves teaching so much that they not only create something to improve learning in their classrooms but has the desire to create a product that will help and improve the instruction for others.